ITWhiz Son is messing around with the layout of my blog. I like the photo grouping across the top but may get him to put a couple of different ones on that better reflect the types of plants that I like to propagate. The warm wind today will finish off the wattles here I think. Acacia notabilis (Notable Wattle) had a few isolated golden balls as opposed to the masses of flowers in previous years. Acacia wilhelmiana was looking quite good but is going ‘off’ now. This grows along the roadsides here. They are a wide shrub, perhaps 3-4m by about 2m tall. They create a hedge like effect and would be great for that hedge or screening effect, especially in wind break plantings. As always, drought tolerant, frost hardy and lime tolerant. 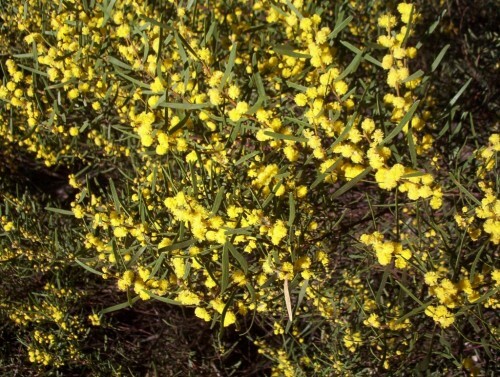 Many people complain that wattles cause allergic reactions etc yet it is denied that these are the culprits. Many grasses cause hayfever and most flower when the wattles are also in flower. I love the cheery colours as they begin flowering when it is still dull and grey here.